YouTube platform has come a long way from just being a video streaming site to being a platform to showcase raw talent. Being the 2nd biggest search engine, it has different things to offer to its users. You get videos about someone’s life, guides, entertainment & lot more. Most music producers release their new music video directly on YouTube. While YouTube’s smartphone app has evolved a lot, only thing which remains unchanged since it’s dawn is, it doesn’t allow “Background playback in YouTube App”. It’s fair to believe, it won’t change in near future because of copyright issues. Step 1. 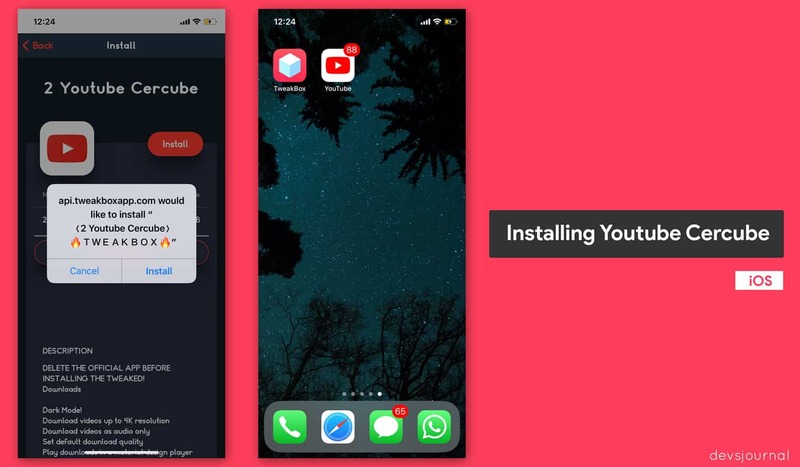 Remove any other YouTube app installations as it might create problem. Also, you don’t need 2 YouTube apps as this app would be enough for everything. Step 2. Open Safari browser and enter this url “tweakboxapp.com“. Don’t use Google Chrome or any other browser as it tends to give errors. Step 4. 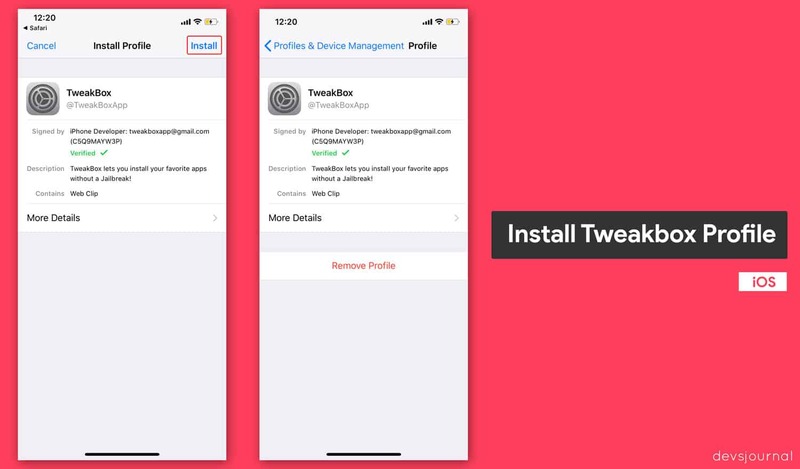 After clicking allow, it will take you to a “Install Profile” settings page which states the description about the App’s developer, description. Click on the “Install” option at the top of the settings page. Step 5. 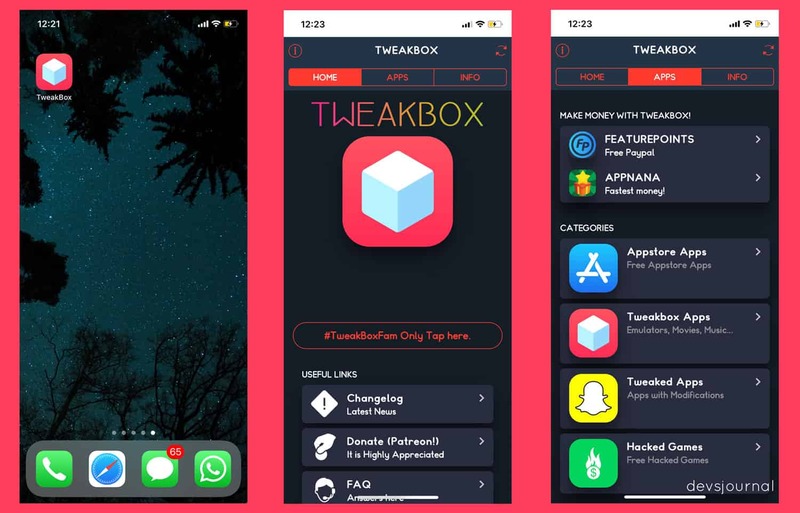 Go back to Home Screen and you’ll find a new App as “Tweakbox”. Launch the app & wait for the Advertisement to appear, wait 3 secs to see the cancel button then click on the cancel button at the top left corner. Step 6. Switch to the APPS tab from the top and you’ll find different App categories; App Store Apps, Tweakbox Apps, Tweaked Apps and Hacked games. It would hardly take you few minutes to know about all the apps & their features in each section. Step 7. Click on “Tweaked Apps” and you’ll find and app named as “YouTube Cercube” at the top. If you don’t find it, you can search it from the top. Step 8. 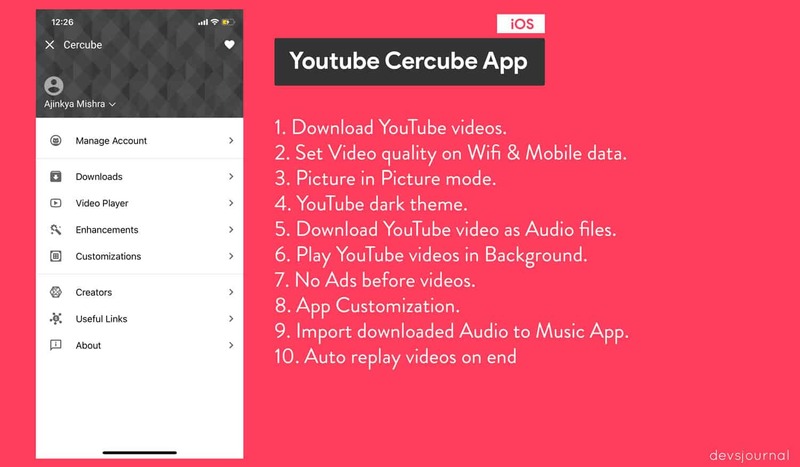 After clicking, it will take you to YouTube cercube’s description and what all features it has. Click on the “Install” button at the top right corner. Step 9. 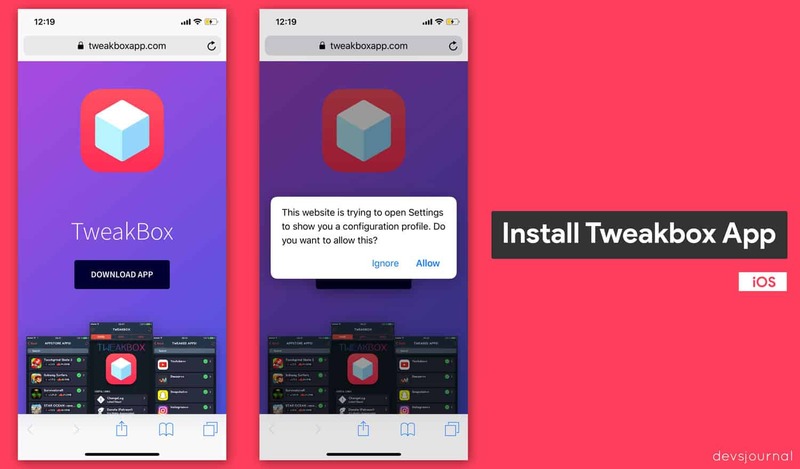 After clicking, you’ll see a message box which reads “api.tweakbox.app.com would like to install <2 Youtube Cercube> ? Tweakbox ?”. Click on “Install” option. Step 10. After clicking, you can minimize the App until it installs the YouTube app. You will find a new app installation on your homescreen. Note: After installation of the app, make sure to allow the App certificate. Go to Settings > General > Profiles & Device Management > Find unallowed Profile & click on it. If you find YouTube app in that profile, click on “Trust Youtube”. After that, you can use the YouTube app without any problem. Just sign in & enjoy. Cercube is localized in English, Arabic, German & Italian. To find complete Changelog of YouTube cercube, you can check App author’s page. 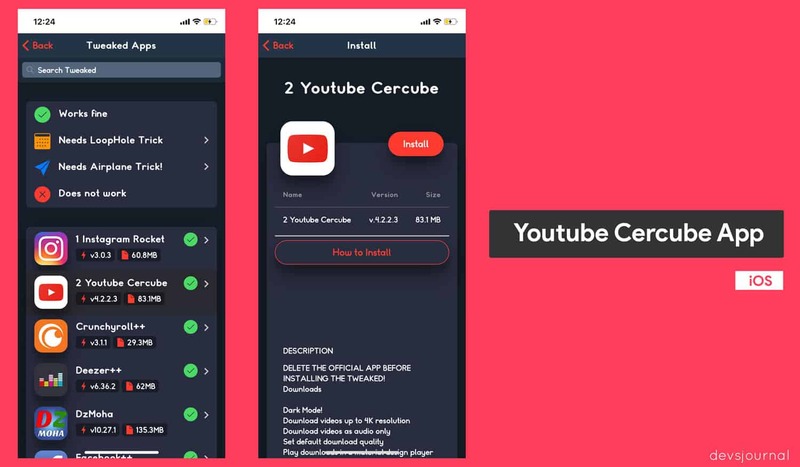 YouTube Cercube allows iOS devices to play YouTube videos in Background, download the videos and lot more which is not found in official YouTube app because of different issues. The best part about this app is, it doesn’t require Jailbreak. Yes, you read it right, YouTube Cercube works on any iPhone device without Jailbreak. Even if you have jailbroken your iPhone, it doesn’t matter; this app would still work just fine. It has support for iPhone X to fill up the notch space so you don’t need to worry about missing out on screen space. 5. Supports iPhone X, iPhone 8 & other iPhone devices. It also supports iOS 11. We in no way support disabling Ads on YouTube videos as it’s the only way to support the content creators. Please disable the Ad blocker in the App, To disable the Adblock, goto YouTube App, click the gear icon at the top > Enhancements > Disable Adblock. That’s it folks! Stay assured as this doesn’t lead to any kind of account ban or suspension. This is completely safe and I have been using this App for quite a time now. The app does has a sticky Ad bar on the Youtube home screen which helps support the developer. Sometime you might click that Ad accidently which can be annoying. If you want to update the app, just go to Tweakbox, find the Youtube Cercube app and install it. It will overwrite the existing package. Let us know in the comment section about your experience with this app.